Washington DC, Oct. 5, 2009--The Washington International Horse Show (WIHS) is thrilled to announce that famed illustrator Michael Paraskevas, of Southhampton, NY, has created the poster artwork for the 51st annual Washington International Horse Show. “The artwork is wonderful. The image of Washington at night is truly spectacular and Mickey captured all this in a fun and whimsical way,” said Juliet Reid, WIHS President. The poster, as well as matching sets of notecards and postcards, will be available at the souvenir stand at the show, taking place Oct. 20-25 at Verizon Center. The poster also will be available for purchase online after the show at www.wihs.org. No newcomer to horse shows or show poster design, Paraskevas is a regular at Hampton Classic Horse Show, his neighborhood show, and has designed its popular poster a number of times. For the Washington International, he brings a special Washington, DC, flair to his poster design. The Washington International Horse Show is a unique and storied equestrian event held annually at Verizon Center in Washington, D.C. 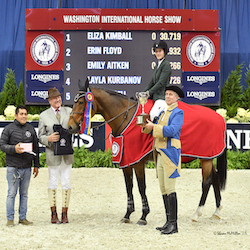 The Washington International Horse Show is one of the leading equestrian events in the country and hosts the top horses and riders from around the nation and the world in the last great metropolitan indoor horse show. A highlight of the annual equestrian calendar, WIHS celebrated its 50th anniversary in 2008. Michael Paraskevas, a well known illustrator among magazine art directors, has had his work featured in such prestigious publications as Sports Illustrated, Time, Town & Country and Esquire, and has earned numerous awards from industry professionals. Michael has exhibited at Giraffics Gallery in East Hampton (6 one-man shows) and recently showed at the prestigious Southampton Gallery owned by Peter Marcelle. Along with his mother Betty, he has published more than twenty children’s books over the past 12 years. Their work includes the much-loved Tangerine Bear, which was produced as a Christmas Special for ABC in 2000. Other popular works by the pair include Junior Kroll, A Very Kroll Christmas, Shamlanders, The Ferocious Beast, Cecil Bunions, and Chocolate at the Four Seasons. The mother-and-son team’s most well-known project, called Maggie and the Ferocious Beast, was developed for Nickelodeon’s children’s channel – Nick Jr. and is still running on Noggin. It won the prized Gemini Award for best animated show of 2001 in Canada. Currently Michael and Betty are writing, producing and starting an online puppet show called The Cheap Show. The team also writes and draws a comic strip, The Green Monkeys, for Dan’s Papers in the Hamptons. It can be seen at www.thegreenmonkeys.com. The two also operate The Paraskevas Gallery in Westhampton Beach on Long Island, during the summer and fall months. The Gallery showcases all of Michael’s illustrations and autographed books and is open in the evenings and by appointment. Paraskevas was educated at School of Visual Arts in New York where he also received his Master’s Degree in Visual Journalism.